Previous postOops…. Did pharma really say that? Next postKathleen Lynch; Minister with responsibility for mental health? Similar situation here in Canada. Man given antidepressants for situation not related to depression. He did not recognize the side/adverse/after effects and thought he had gone insane and decided he didn’t want to live like that. He jumped. Ruled a suicide. Another case: antidepressant given for pain after fall in yoga class – again adverse effects not recognized – further meds, hospitalization for 6 months and more meds and then ECT…and then no memory. Recluse. Terrible stories and unfortunately happening all the time. 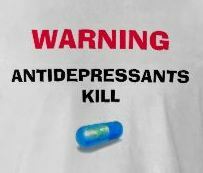 Unless the doctors start warning people of the dangers of these drugs when handing them out, people will keep dying and worse, be left with a half-existance. Though this would mean that doctors will have to inform themselves and stop believing in drug company propaganda. These drugs double the risk of suicide and agression and yet are handed out for complaints from betwetting to hot flushes/hot flashes. Shame! !